*NOTE* THIS COMPETITION WAS ANNOUNCED IN ERROR AND CAN NO LONGER BE ENTERED! The closing date for online entries is the 10th January 2013 at 10am. 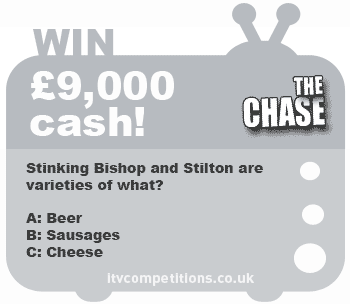 Stinking Bishop and Stilton are varieties of what? C: Cheese – we think C! NOTE: the itv.com online entry form is currently not available!? !